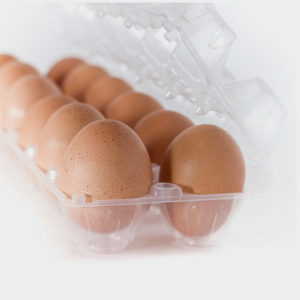 Plastic egg cartons are made from Plastic #1 (PET). Find out how to dispose of Plastic #1. Paper cartons, which biodegrade easily, are a more eco-friendly packaging choice than plastic. Plastic #1 can be recycled, but only for a limited number of times, and it does not biodegrade. Use your empty egg cartons as organizers for garage items such as nuts, bolts and screws, or craft items such as buttons, threads, beads and pastels. Poke holes in the bottom of each egg compartment so that they can drain, and use the container as a seed starter.